Observations by the NASA/ESA Hubble Space Telescope have come up with a new class of planet, a waterworld enshrouded by a thick, steamy atmosphere. It’s smaller than Uranus but larger than Earth. 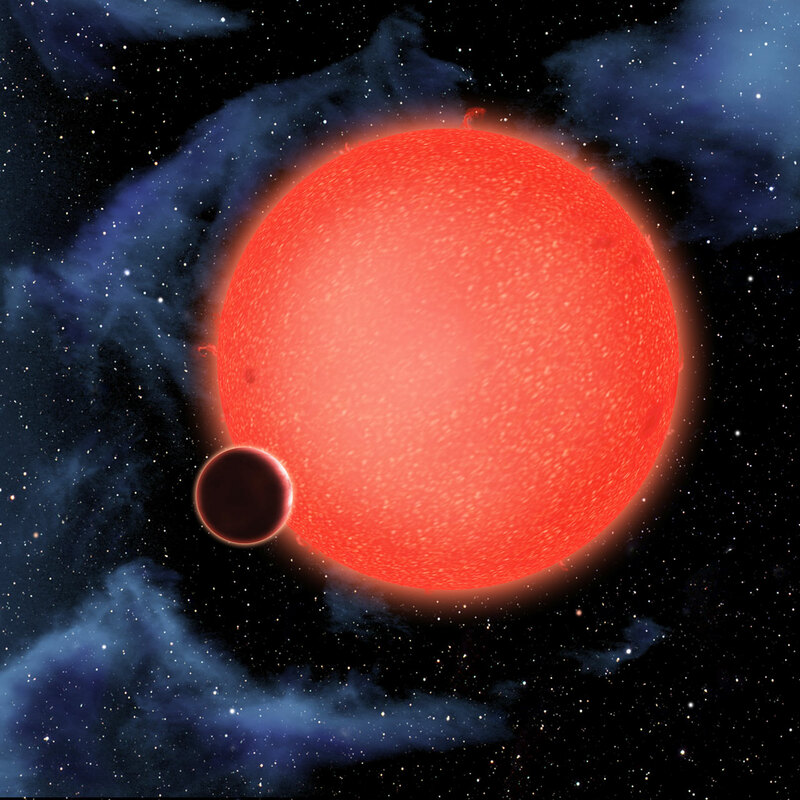 An international team of astronomers led by Zachory Berta of the Harvard-Smithsonian Center for Astrophysics (CfA) made the observations of the planet GJ 1214b. The ground-based MEarth Project, led by CfA’s David Charbonneau, discovered GJ 1214b in 2009. This super-Earth is about 2.7 times Earth’s diameter and weighs almost seven times as much. It orbits a red-dwarf star every 38 hours at a distance of 2 million kilometres, giving it an estimated temperature of 230 degrees Celsius. In 2010, CfA scientist Jacob Bean and colleagues reported that they had measured the atmosphere of GJ 1214b, finding it likely that it was composed mainly of water. However, their observations could also be explained by the presence of a planet-enshrouding haze in GJ 1214b’s atmosphere. Berta and his co-authors, who include Derek Homeier of ENS Lyon, France, used Hubble’s Wide Field Camera 3 (WFC3) to study GJ 1214b when it crossed in front of its host star. During such a transit, the star’s light is filtered through the planet’s atmosphere, giving clues to the mix of gases. “We’re using Hubble to measure the infrared colour of sunset on this world,” Berta explained. Hazes are more transparent to infrared light than to visible light, so the Hubble observations help to tell the difference between a steamy and a hazy atmosphere. They found the spectrum of GJ 1214b to be featureless over a wide range of wavelengths, or colours. The atmospheric model most consistent with the Hubble data is a dense atmosphere of water vapour. “The Hubble measurements really tip the balance in favour of a steamy atmosphere,” Berta said. Since the planet’s mass and size are known, astronomers can calculate the density, of only about 2 grams per cubic centimetre. Water has a density of 1 gram per cubic centimetre, while Earth’s average density is 5.5 grams per cubic centimetre. This suggests that GJ 1214b has much more water than Earth does, and much less rock. As a result, the internal structure of GJ 1214b would be extraordinarily different from that of our world. “The high temperatures and high pressures would form exotic materials like ‘hot ice’ or ‘superfluid water’, substances that are completely alien to our everyday experience,” Berta said. Theorists expect that GJ 1214b formed further out from its star, where water ice was plentiful, and migrated inward early in the system’s history. In the process, it would have passed through the star’s habitable zone, where surface temperatures would be similar to Earth’s. How long it lingered there is unknown. GJ 1214b is located in the constellation of Ophiuchus (The Serpent Bearer), and just 40 light-years from Earth. Therefore, it’s a prime candidate for study by the NASA/ESA/CSA James Webb Space Telescope, planned for launch later this decade. A paper reporting these results has been accepted for publication in the Astrophysical Journal and is available online. The calibration of the WFC3 slitless spectroscopy modes was undertaken by the Space Telescope European Co-ordinating Facility as part of ESA's contribution to the Hubble Space Telescope project.